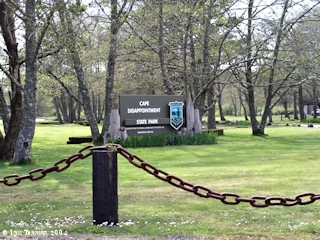 Click image to enlarge Cape Disappointment State Park, formerly Fort Canby State Park. Image taken April 9, 2004. In 1862 Cape Disappointment was armed with smoothbore cannons to protect the mouth of the Columbia River from enemies. It was generally known as "Fort Cape Disappointment". In 1865 Fort Stevens, complete with a moat and drawbridge, was established across the Columbia on the Oregon side of the Columbia. For the next ten years these two forts protected the mouth of the Columbia. In 1875 "Fort Cape Disappointment" was improved and became Fort Canby. Fort Canby was named after General Edward Canby, who was killed in the Modoc Indian War. "... When the U.S. military constructed 22 cannons around the Cape Disappointment Lighthouse during the Civil War, the fort was unofficially known as "Fort Cape Disappointment". It wasn't until 1874 (86 years after Meares' disappointment) that the cape was given the label, "Fort Canby." The secretary of state officially renamed the fort to honor General Edward Canby, who was assassinated druing the Modoc Indian Wars. The moniker Fort Canby was to stay with the landscape for the next 129 years. Even when the fort was closed after World War II, the state park that took its place continued the military name. ..."
"... Then the Lewis and Clark Bicentennial arrived, and at the same time, a major "master plan." The Washington State Parks Commission determined to honor the older history of the cape, and once again renamed the headland Cape Disappointment. ..."
In 1896 Fort Columbia was built and in 1897 Fort Stevens was improved. The mouth of the Columbia River was now protected with three forts. "... FORT CANBY: A deactivated military fort on Cape Disappointment overlooking Baker Bay / Columbia River. An Executive Order, dated February 26, 1852, reserved Cape Disappointment for military purposes. Cape Disappointment Lighthouse was placed in operation October 15, 1856, but construction of a post and fortifications were delayed until August 1863. The fort was not activated until April 15, 1864. For a number of years after its establishment the fort was generally known as "Fort Cape Disappointment". Finally, on February 13, 1875, the government designated the post "Fort Canby" in honor of Brevet Major General Edward Richard Sprigg Canby, who had been killed by the Modoc Indians, April 11, 1873. A post office was established June 30, 1890 and continued until January 31, 1923, when it was closed. Fort Canby was deactivated on March 28, 1947. ..."
Battery 247, in operation between 1943 and 1947, was located on the top of McKenzie Head at Fort Canby. Battery 247 was one of three Batteries surrounding the mouth of the Columbia River. Battery 245 was located at Fort Stevens, Oregon, and Battery 246 was located at Fort Columbia, located at Chinook Point, Washington. Cape Disappointment State Park -- formerly Fort Canby State Park -- is a 1,882-acre camping park, offering 27 miles of ocean beach, two lighthouses, the Lewis and Clark Interpretive Center, and many hiking trails. Penny Postcard: Cape Disappointment Lighthouse, ca.1908. Penny Postcard, Postmarked 1908, "Fort Canby Light House, Ore." Note the cannons of Fort Canby. Card #12, O.W. Whitman, Astoria, Oregon, "hand-colored". In the private collection of Lyn Topinka. Penny Postcard: Cape Disappointment Lighthouse, ca.1912. Penny Postcard, Postmarked 1912, "Fort Canby Lighthouse, Mouth of Columbia River, near Seaside, Oregon." Note the cannons of Fort Canby. Published by Pacific Novelty Co., San Francisco. Card #5222. Card is postmarked September 5, 1912. In the private collection of Lyn Topinka. S. 20° W. 4 Miles to a Small rock island in a deep nitch passed a nitch at 2 miles in which there is a dreen from Some ponds back, the land low opposite this nitch a bluff of yellow Clay and Soft Stone from the river to the Comencement of this nitch below the Country rises to high hills of about 80 or 90 feet above the water- at 3 miles passed a nitch- this rock Island is Small and at the South of a deep bend [near Illwaco, Washington] in which the nativs inform us the Ships anchor, and from whence they receive their goods in return for their peltries and Elk Skins &c. this appears to be a very good harber for large Ships. here I found Capt Lewis name on a tree. I also engraved my name & by land the day of the month and year, as also Several of the men. from Cape Disapointment to a high point of a Mountn. which we shall call [the Nicholas Biddle version has Clarke's Point of View inserted here. "Clarke's Point of View" is today's Tillamook Head, a name received when Clark visited and climbed the formation in Janaury 1806.] beares S. 20° W. about <40> [WC? : 25] miles, point adams is verry low and is Situated within the direction between those two high points of land, the water appears verry Shole from off the mouth of the river for a great distance, and I cannot assertain the direction of the deepst Chanel, the Indians point nearest the opposit Side. the waves appear to brake with tremendious force in every direction quite across a large Sand bar lies within the mouth nearest to point Adams [Point Adams] which is nearly covered at high tide. I suped on brant this evening with a little pounded fish. Some rain in the after part of the night. men appear much Satisfied with their trip beholding with estonishment the high waves dashing against the rocks & this emence ocian.